Bay windows will offer your home additional seating and a unique view of life. There are many different windows for you to choose from for your home. 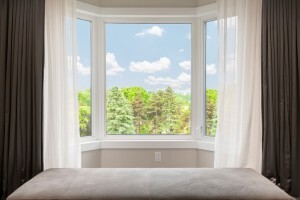 From garden windows to bay or bow windows, there are many different options to choose from. These windows will change to look and feel of your home. So what types of specialty windows are there? Read on to find out. Bay and bow windows are often a popular choose in specialty windows for any homes. Each of these windows comes out of the exterior walls to create a small shelf. Some windows allow for a bench seat while others allow for smaller items like plants. Bay windows are usually a better fit for modern homes. They are usually flat window panes set into angled frames that are built out of the house. Brow windows are a better fit for older, Victorian style homes and are customized curved windows that come together to create a circular outcropping on the side of your home. Skylight windows are often used to add additional light to exterior rooms inside your home. They are essentially windows for the roof of your home and are similar to roof vents. Some skylights open and close for ventilation while others remain closed constantly and only serve the purpose of bringing light into the space. Garden windows are like mini bay windows for your home that are meant for plants. These windows serve as tiny greenhouses and add some dimension to your home. Since plants need sunlight to grow, these windows are perfect for starting a herb or flower garden right in your home. These are just some of the specialty windows you can choose for your home. Whether you just want to add more light to your home or more ventilation options, Absolute Home Solutions is here for your specialty window replacement needs! This entry was posted on Friday, August 5th, 2016	at 3:27 pm	and is filed under Windows . You can follow any responses to this entry through the RSS 2.0 feed. You can leave a response, or trackback from your own site.